From Opatija we made straight for Milan to collect more parts from the factory before we planned to move on to Luneville, in France. From the applause of the staff as we entered the main office at Moto Parilla, and the banging on metal by the operatives in the factory when we walked through to the competition Workshop, it was obvious that the news of our limited successes in Skofja Loka and Opatija had arrived ahead of us. We were pleased but at the same time a little embarrassed! Apparently an Italian sports commentator had covered the 250cc race live from Opatija but unfortunately, there had been a cut in the transmission just before I had out braked myself and dropped back from 3rd to 5th position on the last lap, as all of the staff at still thought I had finished in 3rd place! We were very pleased to see that that most of the large sales stock seen on our last visit had gone and the company seemed to be working normally. We were happy to oblige when requested to offload our 250 from the van for inspection and a photo shoot by staff and a visiting delegation of business executives which, if I remember correctly, included two Aermacchi/Harley-Davidson representatives from the States. Once the visiting delegation had moved on to lunch I was approached by one of the engineers,who had earlier helped us prepare our 3 bikes, and was invited to meet design engineer Villani. The engineer was working in a studio on an upper floor above the factory manufacturing area. I was told that I must not tell anyone what I saw in the Studio which had to remain top secret! On entering the studio I could see 10 or more engineers drawing boards all covered with the exception of Eng Villanis board on which there was a full size detailed general assembly drawing of a fantastic looking racing motor cycle. The first thing that came to my mind when seeing the drawing was ‘son of AJS Porcupine’ which I had seen in the I.O.M. some years earlier. 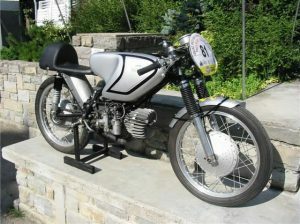 The Engineer, who clearly was working alone in the studio, explained that he had seen my G50 Matchless 5 and 6 speed gearbox drawings and the schematic drawings which I had outlined when we first arrived in Milan and were considering ways Moto Parilla could utilise a development of my constant mesh gear clusters in the 250 cc M.S.D.S. He then went on to describe the racer he was designing which was basically two 120 cc Moto Parilla 2 stroke disc valve go-kart engines mounted back to back making a 240 cc Racer. 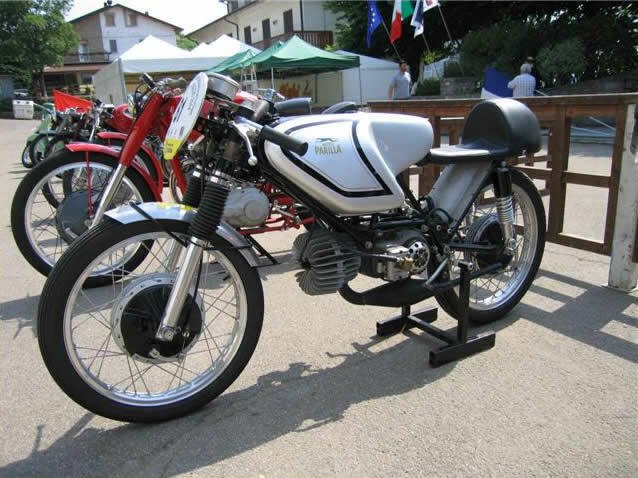 He claimed that each of the 120 cc engines was currently capable of producing 21 BHP at 11,000 RPM and he believed that together he could obtain at least 38 BHP at 10,500 RPM with the engine still having the potential to be developed to run at 11,500 to 12,000 RPM. With a design dry weight of only 84 kgs, I was spellbound and absolutely speechless! To put all this into perspective, in 1964, Honda, Yamaha, Suzuki and MZ may have been getting around 45 BHP or more from their 250 cc G. P engines but with the possible exception of MZ, none of their 250cc Grand Prix machines could better a design weight of 84 kgs or have such a low cross-frontal area (low drag potential) as the racer I was now looking at on the drawing board! From the side elevation the racer was the image of the 125 cc Grand Prix racer which Moto Parilla developed between 1960 to 1965 but at the time I had never seen the 125 or a drawing or photo of it. In fact, I did not know such a machine existed until 40 years later! 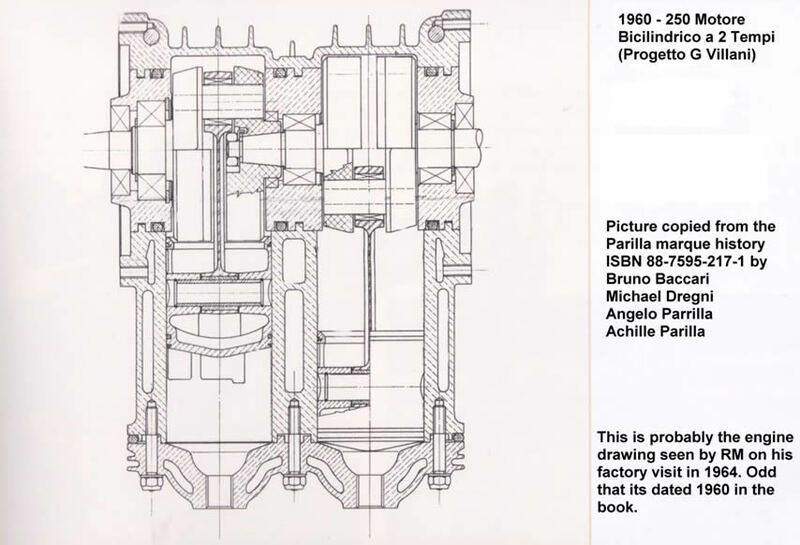 The forward facing flat twin cylinder engine in the G. A drawing was air cooled but the engineer showed me quite detailed drawings of the same engine but with water cooled barrels and air cooled heads and other drawings of the engine with both barrels and heads water cooled. Delaying our departure for Luneville, I spent the rest of the day with the designer discussing various options including gear primary drive, with or without an intermediate gear, and/or chain drives from his proposed central crankshaft coupling to the gearbox which was again to be of unit construction. The gearbox he had already designed into the racer was a conventional 5 speed box but he wanted, if at all practical, to obtain a 6 or 7 speed constant mesh box. My constant mesh design would not have been practical for a number of reasons the principle being that for some reason the designer wanted to maintain the final chain drive on the right hand side of the machine. Prior to our departure for France the following day the G. P project designer informed me if all went well he hoped the racer would be built and ready for track testing by the end of October 1964. He asked me if I would like to test the bike at Monza at the end of my racing program for the year, need I say more? At the time of this meeting with the G. P project designer (and for nearly 40 years after!) I had not appreciated that he was not acting on behalf of Moto Parilla SIL but was in fact, working for the Parilla family who had also taken back the 125 Grand Prix project from Moto Parilla when SIL the Holding Company took over control of Moto Parilla in 1962. 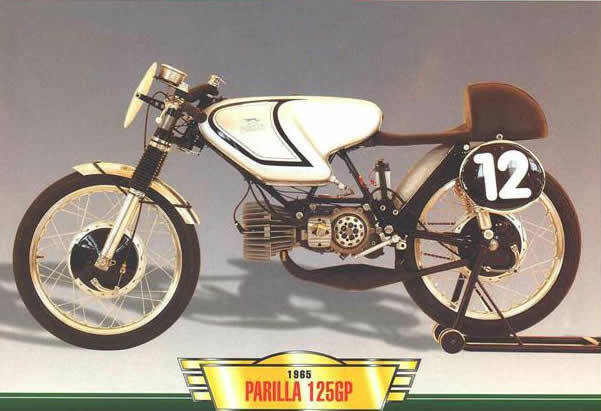 To this day I do not know if Moto Parilla SIL had any knowledge of, or interest in, the 240 cc project which was being developed literally over their heads! On to the next chapter, Luneville…..